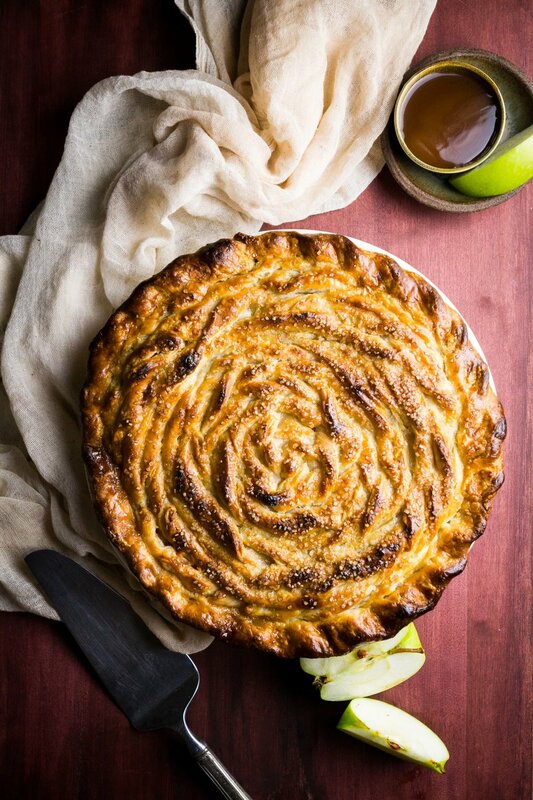 Salted Caramel Apple Pie — knead. bake. cook. On the bright side, this pie came out beautifully. I wanted to do something a fancy for the crust other than a lattice. So instead, after rolling out the top crust, I cut it into ½-inch wide strips and twisted them on top of the pie. The end result looks elegant like a rose or peony but is actually very easy and doesn’t need to be picture perfect. I like this pie because the addition of salted caramel sauce and lemon that gives it a salty tang without being cloyingly sweet. Served à la mode with vanilla ice cream plus another drizzle of caramel sauce, it is perfect for Thanksgiving or whenever you are craving apple pie. If the Salted Caramel Sauce hardens when you add the cream, don’t fear! Simply bring it to simmer again and whisk until smooth. You will have lots of extra Salted Caramel Sauce which can be used in this pear pie, in frosting, on top of ice cream, brownies or just eaten with a spoon. Store extra in a jar in the fridge for several months. Prepare double pie crust according to instructions. Allow dough to chill at least 2 hours. To make the caramel sauce, in a large, dry skillet, heat the sugar over medium-high heat. Cook the sugar until it melts into a medium golden color. Remove from the heat and carefully whisk in the butter, a tablespoon at a time. Whisk in the heavy cream. Return the skillet to medium heat and cook until thick, about 5 minutes. Remove from the heat and stir in the vanilla and salt. Carefully pour into a heat-safe container and cool. Sauce will thicken as it cools. Reserve ½ cup for the pie filling. As the sauce thickens, remove one half of the chilled pie crust dough from the refrigerator. On a lightly floured surface, roll out into a roughly 12-inch circle about ⅛ to ¼-inch thick. Place into a 9-inch pie pan and store in the refrigerator while you prepare the rest of the pie. In a large bowl, mix together apples, lemon juice, lemon zest, brown sugar, flour, salt, cinnamon and nutmeg. Remove pie crust bottom from the fridge and begin layering the apples. Fill any cracks and crevices with smaller pieces. You want to create flat, uniform layers if you can. Once half of the apples have been placed, drizzle in the caramel sauce. Place the rest of the apples on top. Chill in the fridge while you roll out your top crust. Preheat oven to 425ºF. Place a large baking sheet covered with parchment paper or a non-stick baking mat in the middle rack of the oven. On a lightly floured surface, roll out into a roughly 12-inch circle about ⅛ to ¼-inch thick. Cut crust into ½-inch wide strips. They don’t have to be perfect as you will be twisting them. Starting in the middle of the pie, start twisting one of the pie crust strips, going around and around. Keep adding strips as you use them, keeping each layer close together. Continue with the rest of the strips until you reach the edge of the pie. Fold in the edge of the bottom crust creating a nice smooth edge. With your thumb, crimp the edge. Slide the whole pie in the freezer for 15 minutes. Once frozen, remove and brush with egg wash. Sprinkle with turbinado sugar and bake for 45-55 minutes or until the top is golden brown and the juices are bubbling. If pie starts to brown too quickly, cover the top with foil. Let cool for 2 hours before serving. Serve with vanilla ice cream and extra Salted Caramel Sauce if desired.